Here at Cheshire Plumbers, we are leak detection specialists. No matter how big or small, we will get to the bottom of the problem and stop the leak as soon as possible. Whether it is your combi boiler losing pressure or if you have an underfloor heating leak, we utilise state of the art thermal imaging technology to find the source of the leak before addressing the problem. Cheshire Plumbers have been trading for over a decade now and have an extremely satisfied set of customers to date. Whatever the “symptoms” of a leak, our equipment allows us to source where the pressure loss is coming from as we can scan the entire building. 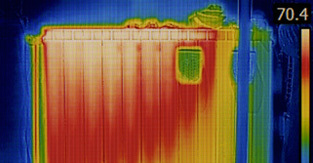 Our infrared cameras allows us to detect the heat and convert it into a signal. From here, our plumbers can see the entire picture of your home and identify any problems within it. This also allows us to see how efficient your current heating system is and we can make additions to save you money on energy bills. But, perhaps the biggest advantage of this method of leak detection is that it is totally unobtrusive and we don’t have to go ripping up floorboards to find the leak. Don’t Ignore a Leak – Contact Cheshire Plumbers Today! An unattended leak can lead to no end of damage in your home including serious structural damage so it is vital to keep on top of this. Using thermal imaging is by far the most efficient form of leak detection and causes the minimal amount of disruption in your home or business. We have not only sourced and stopped leaks, we can also fully audit a premises as well as perform all regular plumbing services. For more information on this, or any of our other products or services, please get in touch with Cheshire Plumbers today.